Frederick Periodontal Associates has been dedicated to excellence in periodontal dentistry since 1993. 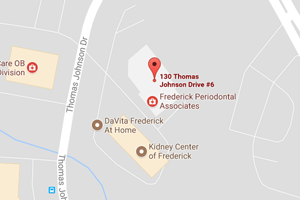 Our practice is located in Frederick Maryland, midway between Baltimore, MD and Washington, DC. Our professional staff currently includes two periodontists and two hygienists. Our new state of the art facility, designed to accommodate the latest advances in periodontal technologies, offers, as well, amenities intended to promote holistic relaxation. We pride ourselves on staying current on the latest techniques used to combat periodontal disease.